The File manager on board the E7 is a capable app that can do anything you can think of with your files - moving, copying renaming, sorting or sending - you name it. You can also password-protect your memory card if you see fit. You can also search for a specific file or directory. With USB On-the-go enabled on the Nokia E7, you can also use the file manger to access USB flash drives and even other phones connected over the provided USB OTG cable. Of all the USB flash drives we tried to connect, the E7 only failed with only one. We tried several card readers too – and they worked! We tried to dazzle with by putting two cards at once (a microSD card and a CF card) and it recognized them both without a hitch. Now that’s a huge improvement over what the N8 can do. The situation with slaving phones is more of a hit or miss – Nokia phones (both S40 and S60) worked and we even managed to get the Samsung Galaxy S to connect (the Nokia’s own N8 failed here). Other Androids and an iPhone 4, however, couldn’t connect so while you can work with thumb drives reliably, you shouldn’t depend on connecting to phones. As you might know the Symbian^3 offers virtually the same image browsing software as its predecessors and honestly, it only qualifies as passable by modern standards. The Nokia E7’s gallery is the same as in the N8. The sweep gestures and getting pinch-zooming are here, but still there is nothing eye-candy inside. The N8 lacks kinetic scrolling and panning and so is the E7. Almost six months later and Nokia is still on the same page. That’s definitely not in its favor. On the positive side opting between portrait and landscape mode is automatic, thanks to the built-in accelerometer. In addition to the familiar pinch gesture you can also zoom in by double taping, the volume slider or even the on-screen slider. Selection of multiple photos for deleting or sharing is available straight from the gallery. There are plenty of sharing options – you can send the image via MMS, email or Bluetooth or you can share it on Facebook, Twitter and other social networks. To do the latter you should configure your social accounts first. The final features of the image gallery include the image tagging system for easier image sorting, the slide show and the albums system (again helping you sort your image database). Overall, picture browsing is relatively fast even with 12 MP pics, but zooming is somewhat slow. You need to wait for a second or two every time you start zooming in on a photo. Symbian never had trouble with the music player features and but its looks were far from impressive. With Symbian^3 however Nokia introduces a new Cover Flow-like interface, which adds the much needed eye-candy. There’s automatic sorting by artist, album, genre and the option to create custom playlists straight on the phone. The music player supports a huge number of formats and it has an equalizer plus a stereo widening feature. There are five equalizer presets, including Bass booster, but you can’t create your own. The Nokia E7 multimedia prowess wouldn't be complete without high quality audio output. Fortunately, the handset managed to deliver on that one too, achieving some excellent scores in our traditional test. And the thing is nicely loud too. 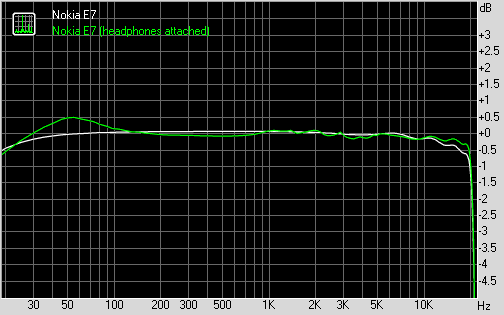 When attached to an active external amplifier (i.e. your car stereo or your home audio system) the Nokia E7 does marvelously with no weak points whatsoever. There wasn't much quality deterioration when we plugged in headphones either. Sure, the stereo crosstalk got a bit worse and we recorded some intermodulation distortion but those are rather hard to detect in anything but lab conditions. The FM radio on Nokia E7 has a simple UI and supports RDS and alternative frequencies. RDS displays the station name and some extra info (say, their website URL) and the alternative frequencies feature automatically re-tunes the radio to another frequency broadcasting the same station when the first signal is weak. The E7’s video player is the same as the one on N8 (prior to the update). It comes with DivX and XviD support out of the box and is quite capable. The playback was silky smooth on all files with a resolution up to and including 720p, which is quite impressive. Combined with the HDMI port this can easily turn the Nokia E7 into a portable big-screen video player. The media player app itself only works in fullscreen landscape mode but, since anything else would have made the widescreen display useless, this is understandable. When in fullscreen, a press on the screen shows the controls, which are normally hidden. The amply sized high-contrast screen is also more than welcome for truly enjoying your clips. Some restrictions do apply, though. For one the handset cannot play any file that is larger than 2GB, it also couldn’t handle none of the 720p MKV files we tried. If you manage to keep your files below that limit (which basically excludes full-length 720p HD movies) you will be fine. The other problem with the video player is the lack of any kind of subtitles support. The N8 was also released without subtitles support, but later Nokia fixed that with an update. We hope the same will happen with the E7. At least the E7 didn’t inherit the N8’s incapability to fast forward and rewind videos larger than 1.5GB. When the battery life is concerned, the Nokia E7 lasted 5:40 h of constant video playback in our dedicated battery life test. The N8 managed 6:20 h but the E7 battery has a bigger screen to worry about. Still, it’s a nice achievement. As a comparison, the iPhone 4 clocked the whopping 9:40 h, while the Galaxy S managed 7:30 h.